Filed under art on May 03, 2015. I listen to The Pen Addict podcast. This is a dangerous thing. Listening causes me to use my precious gadget budget to feed a new addiction, pens and paper. During The Pen Addict podcast, the hosts, Myke and Brad, regularly extoll the fountain pen writing and ownership experience. I decided to see what all the fuss was about and begin shopping Amazon for a good starter fountain pen. Since I am new to the fountain pen game, I only had two criteria for my fountain pen purchase: good looks and an Amazon rating of 4 or more stars. 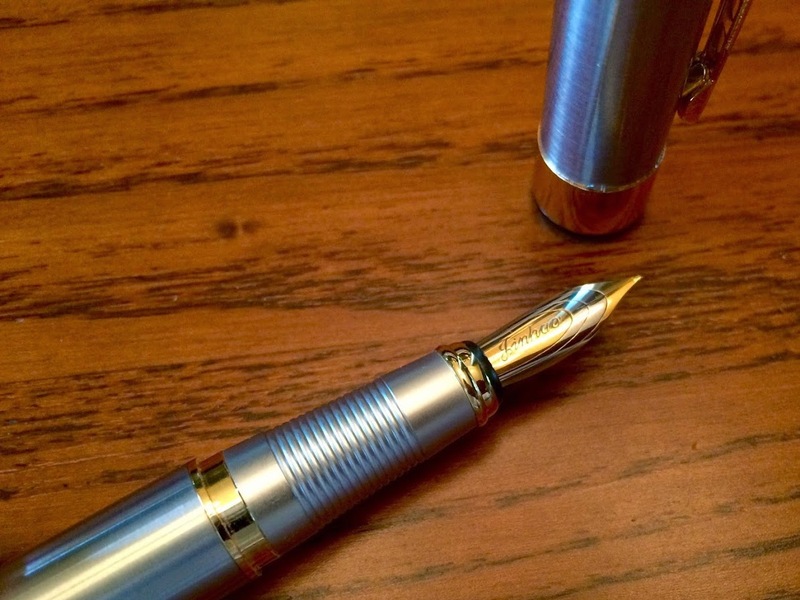 After several hours of review, I chose the JinHao 250 Stainless Steel Gold Trim Fountain Pen - Medium. 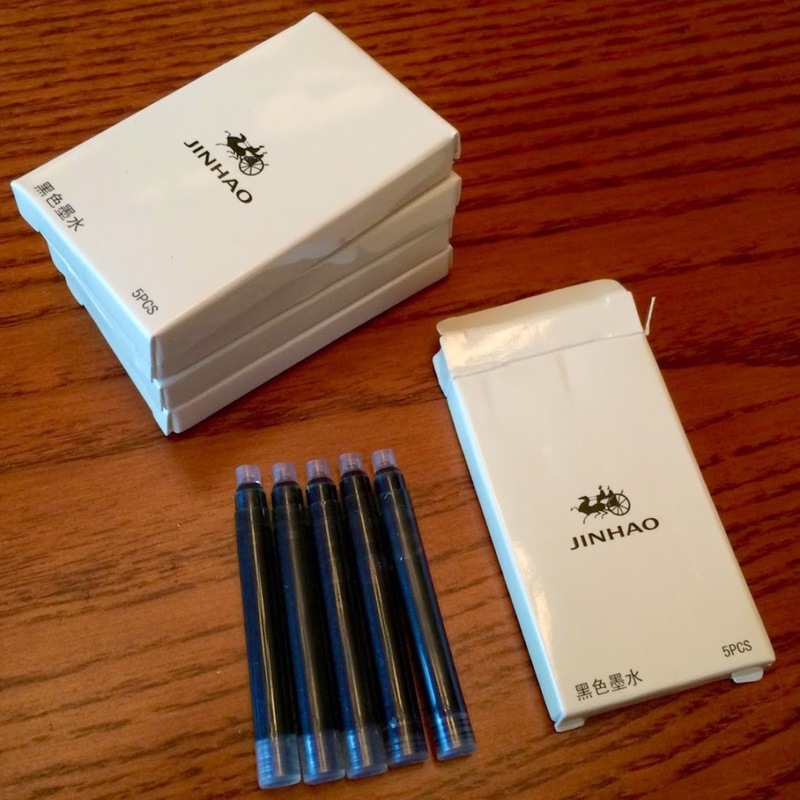 I added the JinHao 250 to my shopping cart along with 5 packs of 5 JinHao ink cartridges as shown in the image below. Surprisingly, the ink cost more than the pen! That’s affordable. 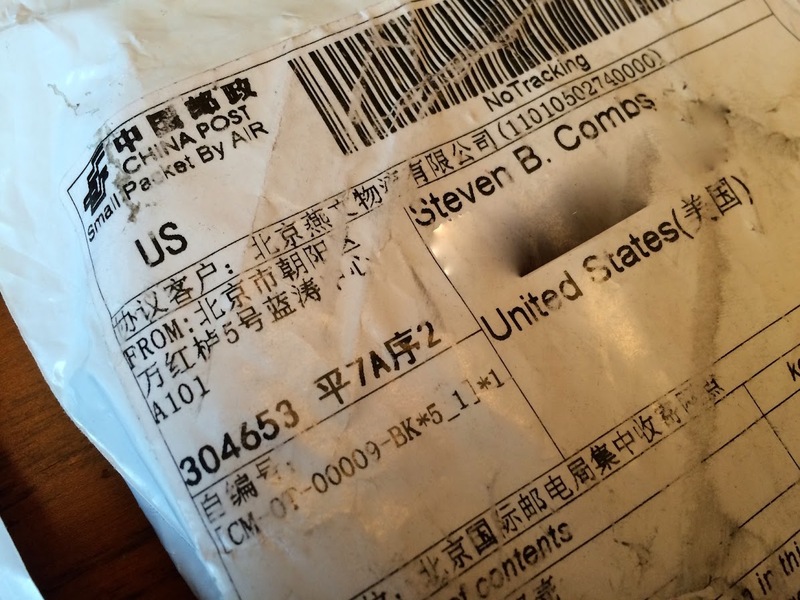 The package was to ship from China and to drive down costs, I choose standard international shipping. I was in no hurry. After about a month, two packages arrived. One one day, and the other the next. I waited until both arrived before I opened either. 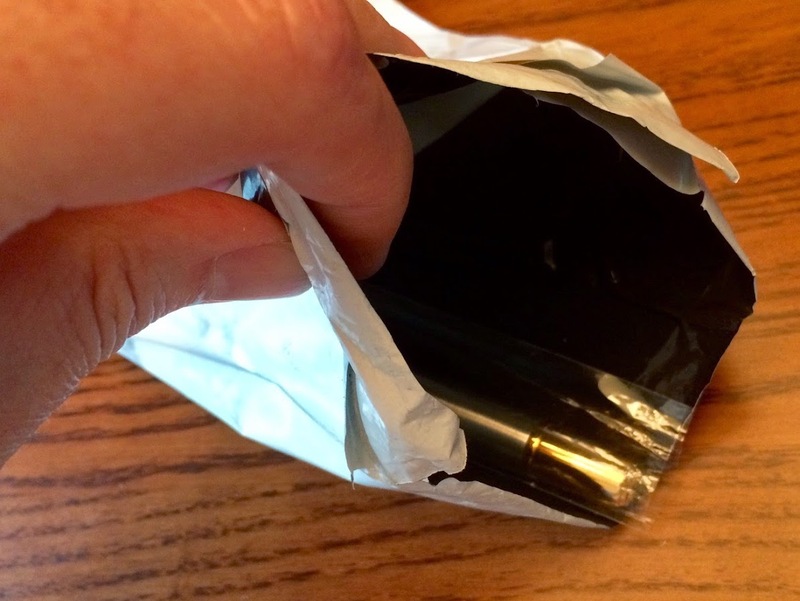 I cut the plastic shipping bags open to see what was inside each and found simple packaging for both the ink and the fountain pen. 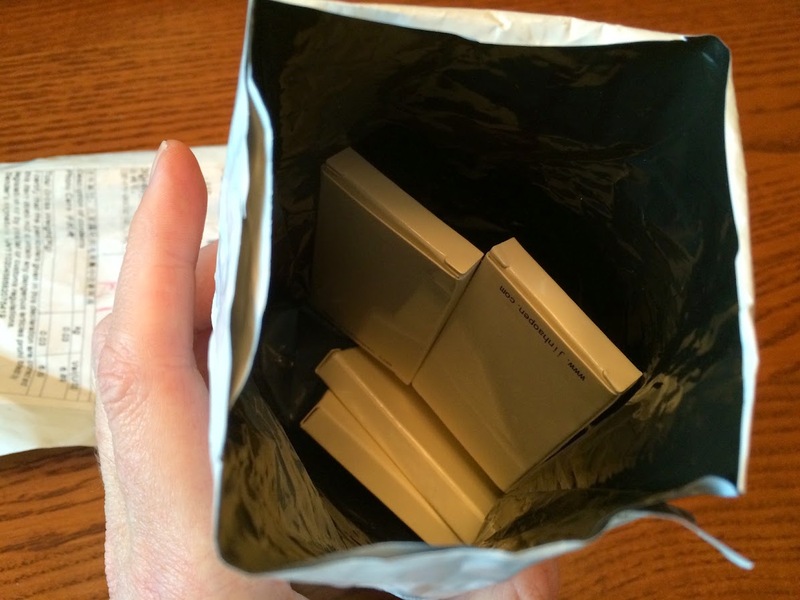 One package contained the five boxes of pen cartridges as shown in the image below. 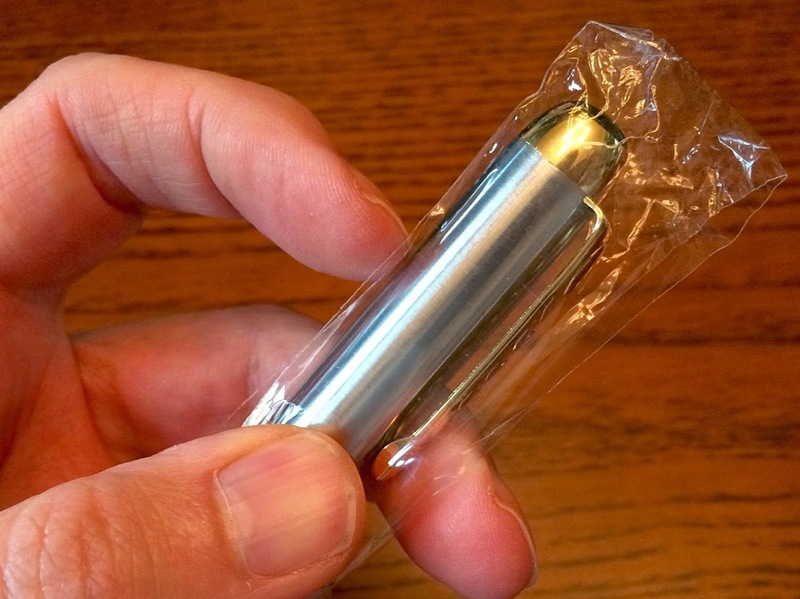 The other package, below, contained the pen in a plastic sleeve. No box. For $3.19 you get a pen, plain and simple. I’m 50 years old and pretty sure I have never owned a fountain pen. I wasn’t even sure how to install the ink cartridge into the pen. Given that there were no instructions for the pen or the cartridges, I knew I could have ink all over me if I didn’t do a bit of research. After a few searches online, I found a site that explained the use of the cartridges. Easy peasy. 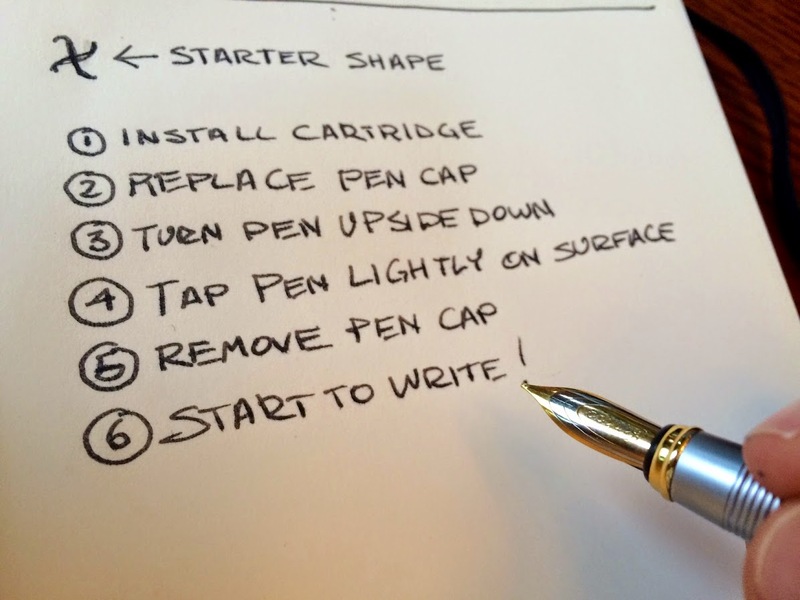 The end shown in the image below is the one to insert into the pen. I was now ready to insert the cartridge. Time to remove the pen from the plastic sleeve. I looked at the pen for a bit before I removed the wrapping. It was an attractive pen. I removed the pen from the sleeve and continued my inspection of the pen. I rotated it gleefully in my hand. It felt good, looked like it cost much more than I paid, and the stainless steel added good weight to the pen. I rotated it both vertically and horizontally a few more times before I finally removed the cap to reveal the nib. I then knew what all the fountain pen excitement is about. The classic look of the nib evoked a since of historic style not found in the common day-to-day ball point or gel pen. 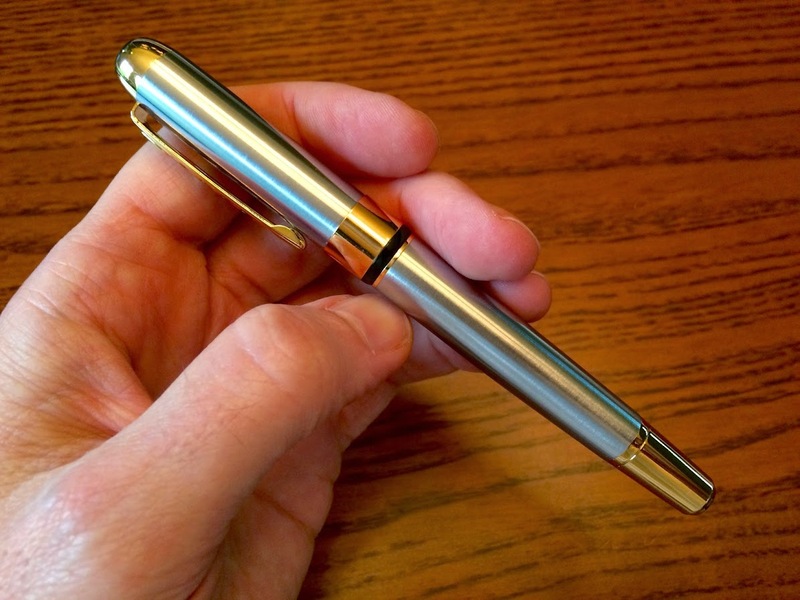 This particular pen had the JinHao name etched into the nib with several etched contour lines enhanced by a two-tone gold and stainless steel color placement as shown in the image above. Below the nib was knurling to assist with grip. As a draftsman used to knurling on my mechanical pencils, I found this a welcome addition. It was time to affix the ink cartridge. I unscrewed the nib holder from the pen barrel. Once separated, I found an ink piston converter inside. As I would learn, an ink converter draws ink from an ink jar. I pulled the ink converter off the nib holder. The ink converter is plastic and seems cheap. I am not sure I would use this converter even if I had a bottle of ink. I imagined ink all over me and my desk. Were I to try a converter, I would probably buy another. Anyone have any recommendations? I separated all the parts to examine them on my desk. I grabbed an ink cartridge and plugged it into the fountain pen. I pushed the cartridge into the nib holder until I heard and felt a slight pop. I then pressed a bit more firmly to ensure a tight seal. Surprisingly, I was able to insert the ink cartridge without making a mess. I replaced the barrel. Time to write! Or so I thought. I knew the ink wouldn’t just flow out of the nib immediately, but I wasn’t ready for no ink after several attempts to write. Because I had never used a fountain pen before, it was time for an online search again. 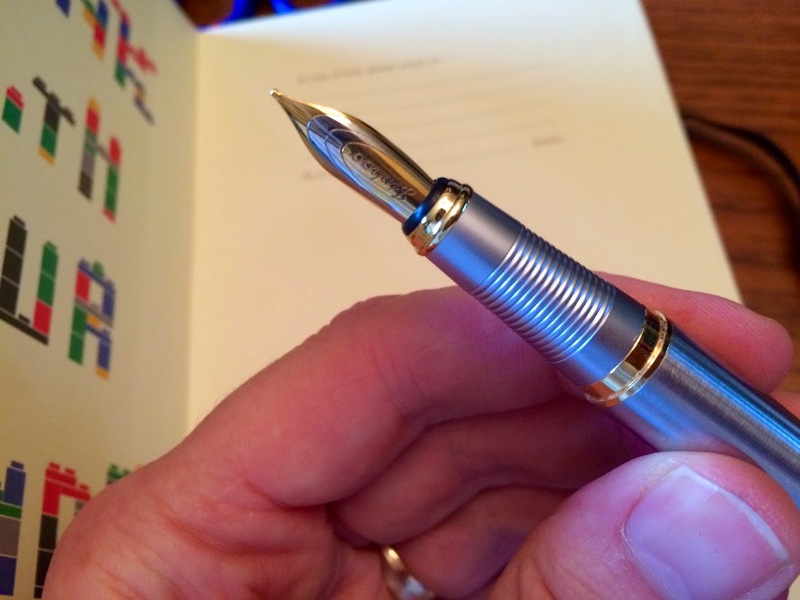 A user recommended lightly tapping the pen on a note book with the cap on and the nib pointing down. I followed the advice and removed the cap. I looked closely at the nib to see if any ink had streamed out. 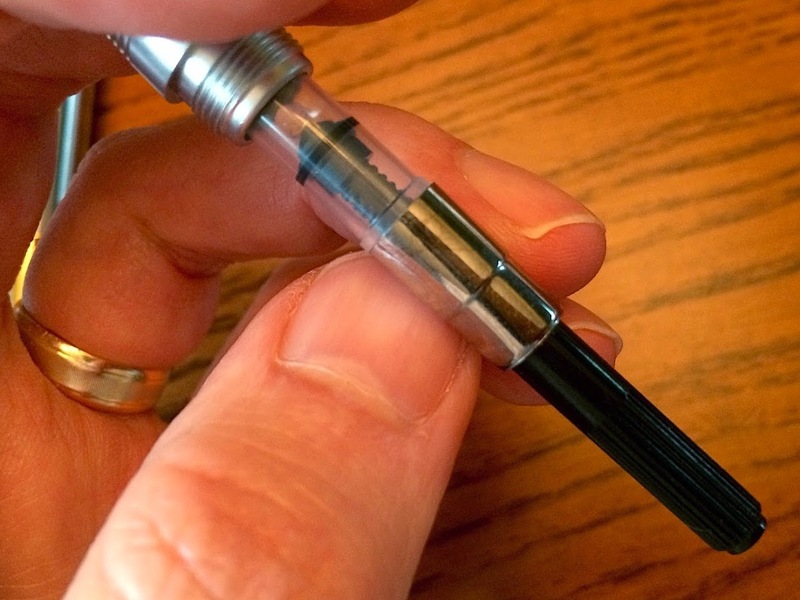 I didn’t see any ink and wondered if this tip would now work. I wrote again and noticed some ink. I created a quick shape and then went over it one more time. The ink was flowing! Let the writing begin. Writing with a fountain pen is different from any other pen I have used. At first, writing with the JinHao is awkward. The pen is heavy. The nib feels scratchy on the paper. The ink pools at various locations along the line. I didn’t like my writing experience but made a commitment to give the pen a try over time. I continued to use it for several days on various writing projects and for fun. I used it to scribe an outline for this blog post. After spending more time with the pen, I have become more comfortable with it. I now have enough hours with the JinHao 250 that I can accurately share my likes and dislikes about the pen and my first fountain pen writing experience. I understand that my dislikes may be due to my ignorance using fountain pens and the quality of the pen and ink. Experienced users may want to take my review with a grain of salt. Even though I have a long list of dislikes, I wouldn’t call this purchase or experience a bust. $8 is a minimal expense and I now have a better understanding of fountain pen operation, terminology, and writing experience. 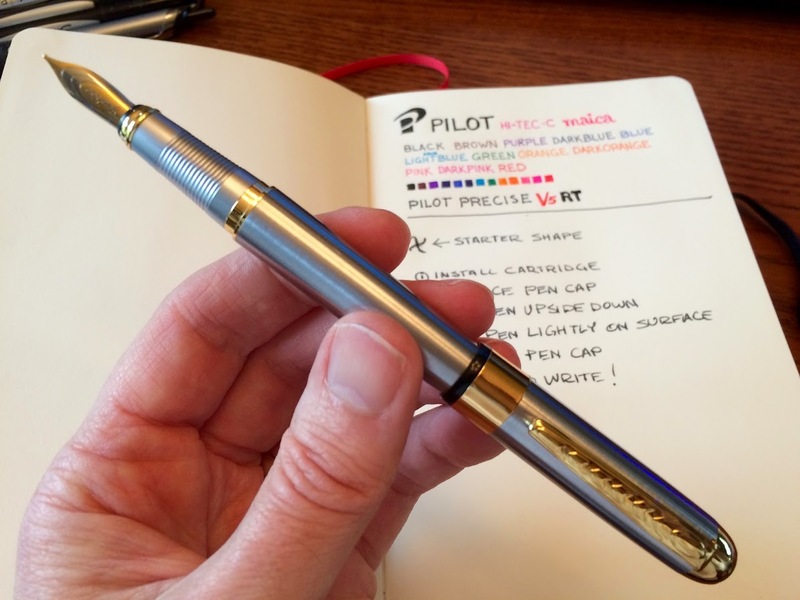 This pen and experience has piqued my interest in other fountain pens. I’ve heard from a colleague and read online that Lamy fountain pens provide an exceptional fountain pen writing experience. I think it is time to begin putting money back for one. In the meantime, I’ll continue to use the JinHao 250. I might even spend some money to buy differing inks and see if I can upgrade the JinHao 250 writing experience. If anyone has ink recommendations, please leave them in the comments below. I also need to learn how to clean and clear ink from a fountain pen. More online research for me. The fountain pen experience is not something you take lightly. Unlike a regular pen you pull out of a package and use, a fountain pen requires care, investment and a learning curve. Before you dive into it, be sure you understand this. The JinHao 250 will become a pen I reach for in the future. At around $8 with ink, the pen provides an excellent way to give a fountain pen a try and I still think this is the best looking $3 pen, fountain or otherwise, I own.